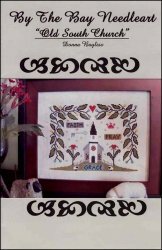 Old South Church [H5957] - $11.00 : Yarn Tree, Your wholesale source for cross stitch supplies. Cross stitch pattern from By The Bay Needleart. White church accented by sheep, vines, floral motifs, and the words "faith," "pray," and "grace." Stitch count 127 x 96. Silver Moon Belfast Linen Short Cut 24"x55"
Smokey White Belfast Linen Short Cut 8"x55"